Hydro Extractors are also called Centrifuges. A multipurpose machine that can dehyderate water content from potatoes and also can extract oil from potatoes after frying. 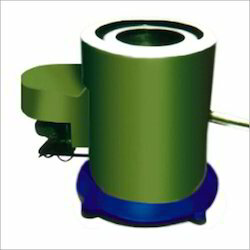 It has capacity of 25kg / hour. We are lead manufacturer and supplier of wide range of Hydro Machines. We offer hydro machine used for extracting extra oil from namkeen or fry potatoes. 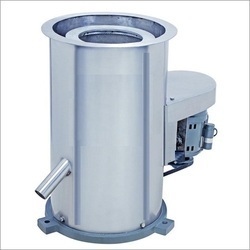 And it also use after the washing of sliced potato into water the excess surface water is removed in dryer machine which is centrifugal system and removes approximately 30% to 40% of water enabling the potato to fry properly machine. Contains S.S.basket with storing capacity is 8 to 10 Kg sliced potatoes. Rajkamal brand 18" Hydro Machine, 25kg. Backed by a team of expeditious and hardworking procuring agents, we are affianced in manufacturing, wholesaling, importing and supplying superior quality Hydro Machine. The offered hydro machine is designed under the management of proficient professionals by utilizing finest quality material as per the specified market norms. The LSHNA series are specially designed for heavy loads. The three point support of the special rigid design of a spring allows for the complete absorption of vibrations and safe operations. - All wetted parts are 304 –stain less steel. Specification : 1/2" hp Motor, 100 Kg/hr. machine capacity. Hydro Machine is suitable for removing much of the moisture of sliced potatoes prior to frying. The Machine mould steel construction with a suitable aluminum perforated fitted and electrically rotated with a suitable motor at high speed to expel water portion from the basket down through the spout or outlet attached at lower side of the machine. Arranged for easy operation and maintenance.